If you’re excited about spring weather, then you might already be planning a few new ways to spice up your garden. It is incredibly easy to spend a small fortune on your garden without even planning on it. This is especially true if you’re working to get your garden together. Luckily, there are so many things you can do to create a stunning garden on a budget that won’t keep you longing for more. So, get ready for the warm weather so you can truly make your garden the envy of the neighborhood. A trellis is a simple way to add charm to just about any space. If you have a shed, gazebo or empty exterior wall of your home, then you’ve got the perfect place for a trellis. You can actually purchase lattice to help get your trellis started. However, if you want to keep things cheaper or you want to have more control over your designs, then you have a lot of options. One is to simply use some scrap wood to help you out. You can assemble it with staples or thin nails and then attach it to the home. Old branches are also a fun option, especially if you’re working with ivy or heavier plants. Of course, if you want to keep things even more artistic, you can purchase special kits that allow you to hook vines on the wall in a specific design, which will encourage plants to grow in that manner. Plants can be one of the most important elements of a garden, but constantly buying pots can be expensive. This is especially true if you’re purchasing heavy duty pots that are designed to look great and stand the tests of time. You can truly do a lot of amazing things using recycled pots though. Try looking for old pots at thrift stores or use your imagination to create fun pots that will stand out in your garden. For instance, if you have old toys, you can easily turn them into a planter. A dump truck, for instance, can have the back filled with soil for a simple style that looks great. You can also paint some of your old pots to give them new life. This is especially fun if you have children that love to help out with such crafts. Another fun wait to add a bit of rustic charm to the garden is to utilize old mailboxes. You can find these items in junk yards, thrift stores and even from your own home. Old mailboxes can be helpful in many ways. If the mail boxes open from the top, you can easily use it as a planter box. Mailboxes that require a stand are perfect for storing items. You can keep your tools and gloves in these boxes, so you have quick access to them without leaving them exposed to the elements. These mailboxes can also be painted to add even more charm to your yard. Bird feeders can be one of the best ways to add a little flair to your garden. You can create a bird feeder out of so many things too, which will add to the fun of creating the perfect garden. One of the best ways to create a bird feeder is to use your imagination. For instance, you can make plenty of bird feeders out of simply using wood and string. Birdhouses can add a touch of charm while acting as a feeder too. These will allow you to paint them to suit your personal needs. Of course, you don’t have to keep it conventional. You might consider purchasing old items from a thrift store like a chandelier or used toys. With a few DIY touch ups, these items can add so much to a yard. If you’re looking for quick ways to spice up the yard, then you might find thrift store feeders to do the trick. Stepping stones can help keep people off of your grass while also allowing you to show off some personal style. You can make your own stepping stones in many ways, but one of the easiest is to simply buy a kit. This will give you the mixture and tools you need to create a variety of stones. Some people prefer kits because you will receive a mold that will make your stepping stones look exactly like stones. However, you can also use many other designs too. For instance, you can make foot prints to go along side the functional stones. You can also make stones with footprints in them. Another option is to coat large leaves with the mixture, so you have a stone with lots of beautiful and natural detailing. Gardens can be a lot of fun to design, but many people tend to plan their garden outward. One great way to get more out of your garden without spending a fortune is to choose plants that grow up. These plants will help create a sense of tranquility in your space and are incredibly easy to care for in most cases. One example of this type of plant is bamboo. The plant will help knock out noises, so you’ll feel like you have your own personal oasis. On top of that, you will have a plant that cleans up the air and soil, which will help your other plants grow. Tall grass is another fun option that takes very little maintenance. You can truly do a lot with landscaping when it comes to this plant. Furniture is one of the best ways to make your garden your own special space. With the warm weather coming, you might be excited to finally be able to get outside. Don’t let your excitement get to the best of you though, as there is no reason to run out and buy a table set or other outdoor furniture. Instead, you can easily make your own for next to nothing. One of the best items to work with when it comes to making furniture for outside is old pallets. Sometimes, you can find these in junk yards. Some stores might even donate or sell the items to you if you talk to the manager. If you have no luck finding old pallets, then it’s pretty easy to build them on your own out of scrap wood. Once you have a few pallets, try to follow a tutorial for a design you enjoy. You can add to the frame with foam or pillow fluff covered in a waterproof fabric. Fabric and the wood used to make your furniture can be weatherproofed with a special spray too, so you won’t have to worry about your items getting ruined. There’s lots of furniture ideas online to choose from, so have some fun with the craft. Rocks are pretty easy to come by and they can add so much to your garden if you know how to spice them up. One of the best ways to do this is to slap on some paint. The design ideas for this craft are pretty much limitless. You can paint the rocks your favorite colors, add your name or even turn them into your favorite characters or animals. Painted rocks can be used to spell out your address, your family name or even greetings for your guests. Some people will even use rocks to label the plants in their garden, which is a great way to prevent your labels from going missing. One of the main problems that people run into when they work on their garden is organization. After everything is planted things can seem a little scattered, which might cause your garden to look less than spectacular. So, before you start working on your garden, you might make a game plan. Consider adding in special places for certain plants to grow. For instance, if you stack your plants it can create a great appearance that will make your plants easy to care for. You might also work on planting in a way that will look aesthetically appealing. One way to do this is to plant certain colors in a specific area or create a design with all of the colors. It’s important to also plant things where they will thrive, so make sure you do your research before planning big. If you’re looking to do more for your garden, then one of the best things you can do is build a compost. This will allow you to transform some of the waste you produce in the home into a fertilizer that will make your garden look exceptional. Building a compost isn’t hard either, which will make it even more valuable to you when you get it up and running. It’ll take a little while to see the rewards of the compost, but once you get it going and use it for your garden, you’re certain to notice a huge difference. Best of all, you’ll be able to help promote a healthier environment, which should make you feel pretty good. Creating the perfect garden doesn’t have to be as expensive as you think. 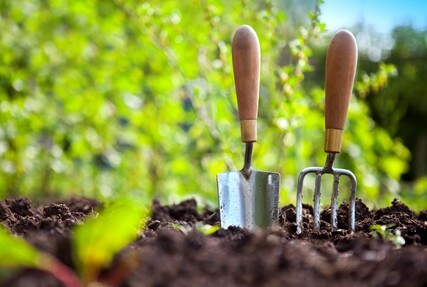 These helpful tips will help you add some much-needed love to your garden without forcing you to go all out on new, expensive gardening supplies. Without a doubt, you’re bound to feel better about your garden’s appearance after trying out a few of these options to add the much-needed personal touch.